In Sinaloa where he was born and throughout other parts of Mexico, Guzman's escape has enhanced his status as an outlaw folk hero. CULIACAN (Mexico) • When Jose Antonio Sevilla and his three brothers learnt that the notorious drug trafficker known as "El Chapo" had escaped from prison, they jumped out of their chairs and shouted with glee. "El Chapo got out! He's the greatest of them all," said Mr Sevilla, 19, a self-professed fan of the drug kingpin, whose full name is Joaquin Guzman Loera. "He was famous before, but now he's even more famous." Mr Sevilla, a car mechanic, was so excited that he attended a march through the streets of Culiacan, the capital of Guzman's home state, last week to celebrate. He carried a sign a woman gave him, which read "El Chapo is more of a president than Pena Nieto", a reference to Mexico's President Enrique Pena Nieto. Why do people admire him? Because he's a living legend. He's like Al Capone. He's like Lucky Luciano. Like Tony Soprano. Like Scarface. He's like a character on a television show, except that he's alive, he's real. BLOGGER ADRIAN CABRERA, on the popularity of Guzman, featured on a T-shirt. Here in Sinaloa state, where Guzman was born, and even throughout other parts of Mexico, the drug trafficker's stunning escape through a hidden tunnel under what was supposed to be the country's most secure prison has enhanced his status as an outlaw folk hero. There are few illusions about the damage Guzman has done. US officials accuse him of contributing to "the death and destruction of millions of lives across the globe through drug addiction, violence and corruption". Yet for many Mexicans, he is an unusual combination of Robin Hood and billionaire, a source of mirth, grudging respect and even outright reverence because of his repeated ability to outfox the deeply unpopular government. "Why do people admire him?" said Mr Adrian Cabrera, a blogger in Culiacan wearing a black T-shirt with a picture of El Chapo. "Because he's a living legend. He's like Al Capone. He's like Lucky Luciano. Like Tony Soprano. Like Scarface. He's like a character on a television show, except that he's alive, he's real." Less than three weeks before Guzman - the head of Mexico's Sinaloa Cartel - escaped on July 11, the US issued a formal request for his extradition, according to a statement by Mexican Attorney-General Arely Gomez Gonzalez last Thursday night. The request, issued on June 25, was made public after testimony by Ms Gomez Gonzalez raised new questions about the relationship between the nations. The US government has been frustrated by the Mexican authorities, who have delayed a decision on whether to accept an American offer of unconditional support to track down Guzman, including the use of drones, advanced intelligence equipment and a task force. The Mexican government had indicated it would keep the prisoner in its custody, wanting to prosecute and imprison Guzman in what many viewed as a show of sovereignty. In January, Mexico's previous Attorney-General, Mr Jesus Murillo Karam, suggested Guzman would never serve time in the United States. "El Chapo must stay here to complete his sentence, and then I will extradite him," Mr Murillo Karam was quoted as saying at the time. "So about 300 or 400 years later - it will be a while." Mexico's President faced a public relations nightmare last Friday as he confronted fallout from the escape of the drug lord, but said that he was "fully confident" the kingpin would be recaptured. Mr Pena Nieto had been flying to France on July 11 when word broke that Guzman had escaped - for the second time in 14 years. Rather than return home, he went ahead with the five-day visit, knowing a firestorm with his name all over it was brewing back home. Mr Pena Nieto addressed the debacle from his presidential complex, acknowledging that the episode had outraged the Mexican people. Guzman's escape has "caused frustration and fury across broad sectors of society", he said. "I am sure and I am fully confident that, with the valour, courage and determination of our armed forces and federal security forces...we will again recapture him," he said. The Mexican Attorney-General's office announced last Friday that seven public servants had been arrested for suspected links to the prison escape. Conspiracy theories are rife. It took 18 minutes for guards at the Altiplano prison, some 90km west of Mexico City, to go into Guzman's cell after they noticed that he had vanished from it. Closed-circuit camera footage released by the government last week showed that Guzman paced in his cell before bending down behind a short partition wall in the shower, then disappearing. 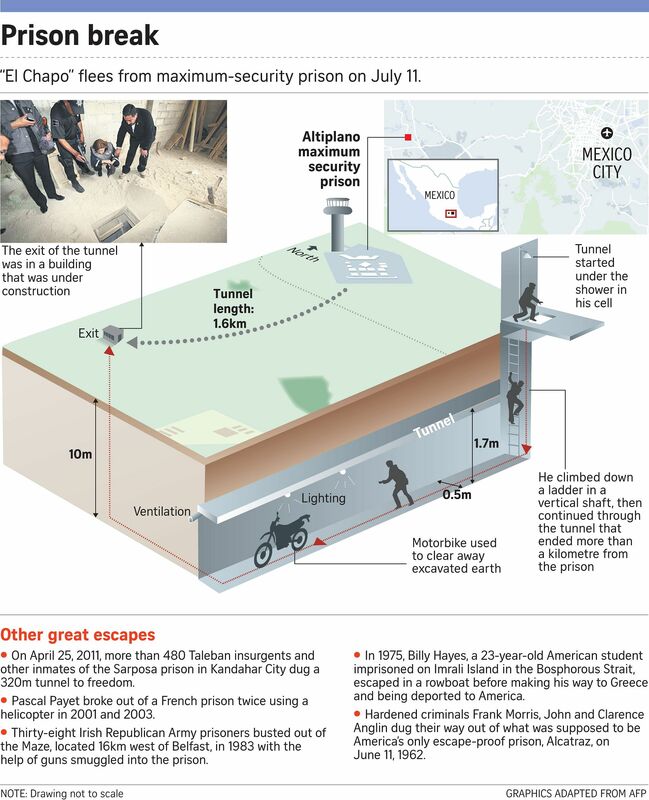 Out of view, the billionaire drug lord crawled through a hole in the floor and made his way through a tunnel fitted with a motorcycle to freedom. Whether Guzman had been warned about the US extradition request, or whether that had any influence on the timing of his escape, is unclear. Extraditions can take years to occur.